PhD Synergistic Protein Blend (Whey Protein Concentrate (Milk), Whey Protein Isolate (Milk)) , PhD Muscle Volumising matrix (Micronised Creatine Monohydrate, Micronised L-Glutamine, Taurine), Fat Reduced Cocoa Powder, Maltodextrin, Dextrose, Dietary Fibres (Acacia Gum, Chicory Inulin), Fructose, Olive Oil, Sodium Carboxymethylcellulose, Xanthan Gum, Flavouring, Mineral Blend (Magnesium Oxide, Zinc Oxide), Vitamin Blend (Ascorbic acid, Vitamin E, Pyridoxine), Methoxyisoflavone, Sweetener (Sucralose). 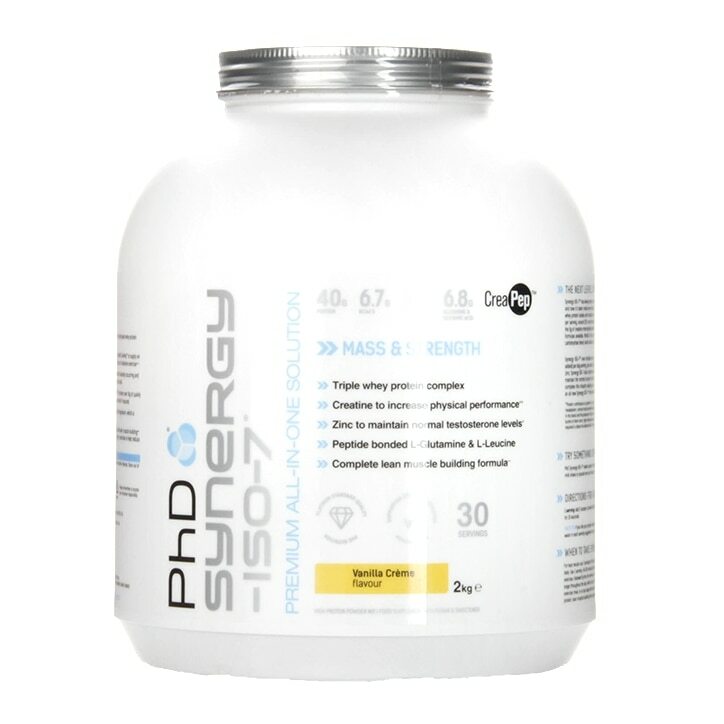 PhD Synergy ISO-7 Vanilla Creme Powder is rated 3.0 out of 5 by 2. Rated 5 out of 5 by PMGr from Tastes Like Vanilla Ice-Cream I really enjoyed this product and will be buying again. If you mix it with cold milk, it tastes like vanilla ice-cream. Tasty, mixes well and i've lost 4kg of fat and gained 3kg of muscle in 3 weeks despite being in a calorie deficit for a cut. Highly recommend. Rated 1 out of 5 by Anonymous from Do not buy absolty awful I'm not even going to finish it it tastes so awful (creme vanila) its like a sort of chemical sugar taste to the point it almost makes me gag. I don't know if this is because for every 24g carbs theres 10g's sugar but I'm not even going to finish it and just throw it away. Really annoyed I bought this Garbage. There is also no inner seal for some reason?